This listing includes a traditional Chinese gong mallet. The Heng Gong has a deeper rim than other Chinese Gongs, and is a bit thicker in the bronze, but it is fully lathed like the Wind Gong. This creates a complex and marvelous mixture of sounds. The smaller Hengs can have a bell-like purity to their tone when played with certain mallets, while the larger Hengs, 26″ and above, are like giant lasers of sound, with focused harmonics and great presence. They are prized by musicians and sound healers. 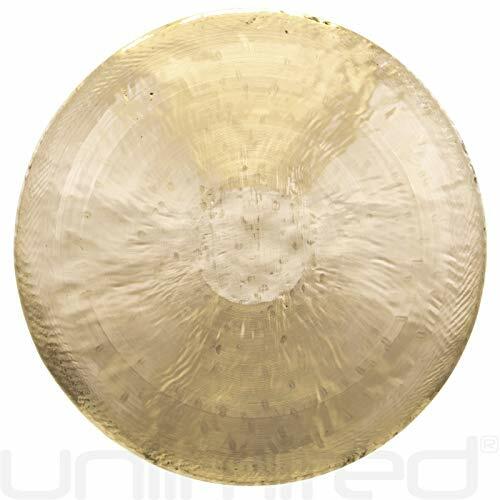 There’s a 12″ Heng Gong in your future. With a solid clear tone and a warming expanse it reminds men and maids alike that they are made of perishable stuff and sound remains a mystery. May it help to align your disparate destinies, bring them all into accord! Many endings may be bittersweet, but there’s real joy to be had in the journey. The 12″ Heng Gong makes a perfect traveling companion. The 12″ Heng Gong means adventure! The 14″ Heng Gong: this year’s Best in Show! Congratulations! Deep tones roll out over the applause. When you ring this gong you will grin, suffused with a deep inner contentment and outwardly beaming with joy. At Gongs Unlimited we’’ve raised a whole passel of these 14”” Heng Gongs. Get one of these beauties for your own collection and see what excellence sounds like. Welcome to the 16″ Heng Gong, the tank of the future! Heng gongs are heavier that your average Chinese gong with a rim twice as deep as most Chinese gongs. This gives the tone feeling of solidity. The 16″ Heng is present; it is there to support you. The tone is long-lasting and though the gong will crash with a hard smack, it’s strength is the powerful, deep tone.